I've been going through tomatoes this summer at record pace making bruschetta, slow roasted tomatoes, homemade tomato sauce, tomato soup, caprese and more. 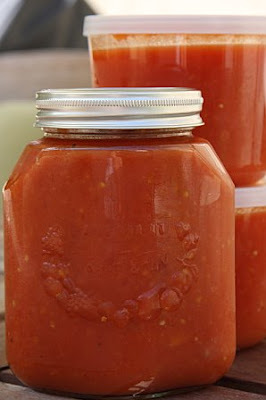 Yesterday I decided to make another batch of tomato soup to freeze for when the baby arrives. If you've ever had tomato soup from the Nordstrom Cafe then you know it's one of the best. I googled and found a few versions of the recipe to use as inspiration. The recipe calls for canned tomatoes but that just didn't feel right considering the amazing tomatoes at the market. I needed peeled tomatoes though so I used part of a recipe from Martha Stewart's Cooking School cookbook on how to prep tomatoes for marinara sauce. Worked like a charm. Blanch & Peel Instructions from Martha: Slice an X into the bottom of each tomato with a paring knife. Working in batches if you have to, lower tomatoes into a pot of boiling water and blanch for about 10 seconds (I did more like 30 seconds). Use a slotted spoon or a spider to remove the tomatoes from the pot. Immediately plunge into an ice bath until cool enough to handle, about 30 seconds. Then pull off each peel, gripping the skin between your thumb and the flat part of the knife blade, starting at the X. Quarter tomatoes and squeeze out seeds. Heat olive oil in a large dutch oven over medium heat. Add onion and saute for 5 minutes. Add carrot and saute for 5 minutes. Add shallots and saute for a few minutes. Add tomatoes, stock, salt and pepper. Bring to a boil, then reduce heat and simmer for 45 minutes. Remove from heat and allow to cool slightly. Puree soup in batches in a food processor until smooth. * If you want to freeze the soup then stop here before adding cream. When you're ready to eat, thaw soup and continue with recipe. When ready to eat, return to saucepan and place over low heat. Stir in basil and cream. Heat until just heated through. Season to taste with salt and pepper.